It's been a year since we've seen a new SinfulShine display. They seem, so far anyway, to be a fall thing. Last year's Hot For Shine collection was terrific, so I was eager to see the new one for myself. I was on the hunt for almost a month! It was up on Nouveau Cheap in August, but I didn't find it until the recent 99¢ sale. They weren't officially part of the sale that time around, but the cashier gave me the deal anyway. Yay! There are eight shades in the display, three of which are new. I debated getting Haute Shine, but I feel like I have endless berry pinks at this point...and most of them are from Sinful! I did get the other two new shades, along with two repromoted ones. Prosecco has dense gold microfleck shimmer in a light taupe cream base. I love getting new work-appropriate options, and Prosecco is right in my comfort zone. I wore it for a few shifts last week. It's got enough sparkle to keep me happy, but is still nice and subtle. This is three coats and it applied well. 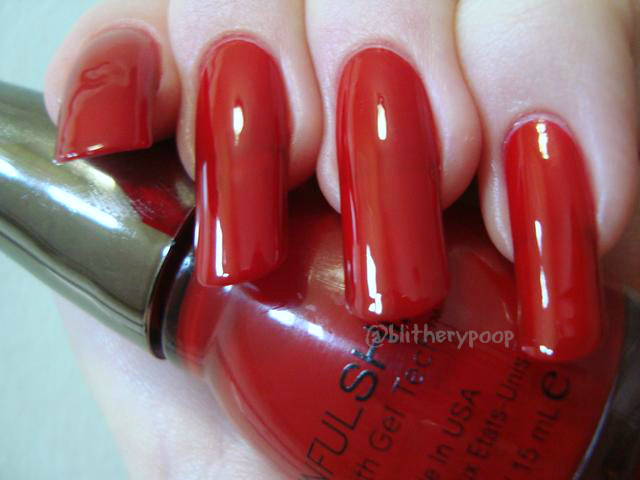 Devious is a lipstick red jelly. A lot of SinfulShine shades are reformulations of Sinful Colors classics. I can't decide, without comparing, if Devious is closer to GoGo Girl or Ruby Ruby, but I feel like it's probably a dupe for one of them. My money's on GoGo Girl. The formula's nice and smooth. This is two coats and I think it's sheer enough that even with 3-4 there'd still be VNL. Shining Couture has a teal jelly base with dense gold microfleck shimmer. It's a VNL kind of post, it seems. The intense shimmer of Shining Couture hides it well though. Love it!! ...I felt like I'd loved it before though. I was almost 100% sure it was a dupe for Kissy, so I googled it. Turns out that Night Swatcher compared them and found that they're not dupes. That's either good or bad, depending on your perspective. If you were hesitant to buy a suspected dupe, rejoice and then go buy Shining Couture. If you missed Kissy, which seems to be discontinued, Shining Couture is only similar. Good formula here too, and this is two coats. Gotta mattify all the shimmers, right? Set The Mood is a dark teal cream. Another one with a dupey feeling. I think Set The Mood is close to Calypso and might even be a full-on dupe, color-wise at least. The formula is different. Calypso is a one-coater, but I needed two for the thinner Set The Mood. One might be enough on shorter nails. Bottom line: Prosecco is the standout. It's new and I can't think of a similar Sinful Colors shade. The other new shade I tried, Shining Couture, is a sister to Kissy, but not a dupe. I have strong suspicions that Set The Mood and Devious are dead-on dupes for GoGo Girl and Calypso. All have good formulas. So I found these during the sale, but I had less luck with the Halloween shades. I only found a couple. So weird. Back on the hunt again soon, I guess! Prosecco is such a cool colour! I love Prosecco!! 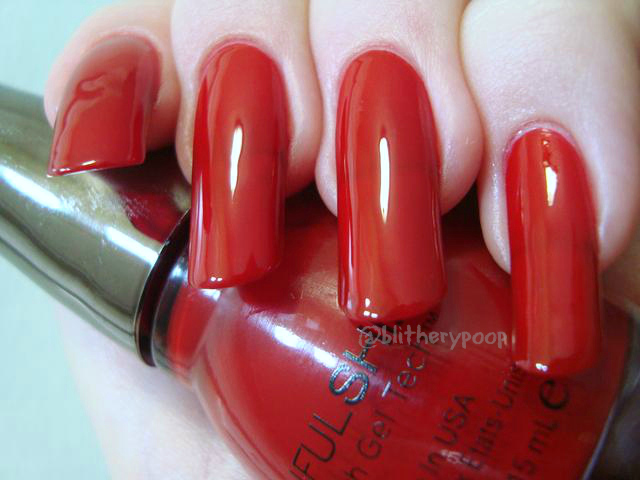 I follow a nail polish group on FB and it is the illusive polish ppl are having a hard time finding (me included). Thank you for the link, Shining Couture (all the shimmers, really) looks amazing mattified!